Ponds, time and place. A Druridge Bay Northumberland blog: The classic Christmas crisis: "i think these batteries are flat"
The classic Christmas crisis: "i think these batteries are flat"
Science sometiems depends on the right bit of kit to measure, map or probe. Personally I'm a great fan of lo-fi and mostly use a pond net and a white plastic tray. Not much that can go wrong there, although the wind that whips across Druridge Bay can pick up a tray and hurl it across a swamp with nonchalent ease. 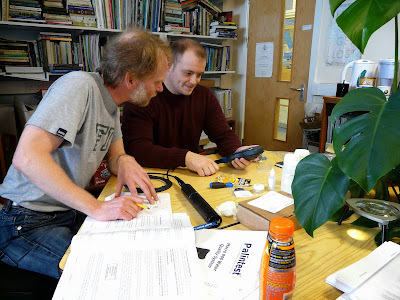 However detailed chemistry requires proper measures and we have just got a new probe which will allow Scott to measure the chlorophyll, oxygen and conductivity in his experimental ponds simultaneosuly and live in the field. It came in a tough, field protable case which was opened with glee to reveal the shiny, exciting bits and pieces. Even came with its own screw driver. Here are Dave and Scott having a first go at starting it up in the office. In perfect synchrony with the seasons the batteries that came with it were flat. How many Christmas Day mornings throughout the UK have been blighted by that howl of anguish? You see why I like a net and a plastic tray.... They'll get it working I'm sure. This Druridge Bay pond blog has been going for just a bit over a year now. We are taken aback by the global coverage: Russia, Argentina, South Africa, Latvia, Canada... Even if you have stumbled across Ponds, Time and Place accidently I hope something of this magical landscape has lightened your day and the mysterious lives of the pond plants and animals have captured your imaginations. Merry Christmas to all our readers.